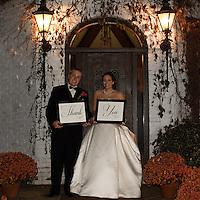 Examples of our wedding albums, designed, printed and bound by Ron Pradetto Photography. 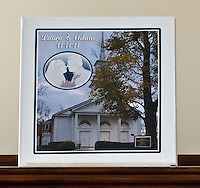 We are showing the front cover of a 12" and 8" lay-flat album with a printed canvas cover. The pages are from a 12" album. Albums are personalized for each couple. They can be made in almost any size up to 12" and any amount of pages, minimum 20 pages. We do all our printing with an Epson Professional 9 ink printer. These pages are printed on Ilford Gallerie Professional, Smooth Lustre paper. Finished result is a beautiful, unique album.